Yes as you may expect on any academic homepage, this photo was taken 5+ years ago. Yan Wang got his PhD degree in Oct. 2015, under supervision of Prof. Shih-Fu Chang. He had rich R&D experience in Adobe Research, Microsoft Research, and Facebook, with his algorithms integrated in Facebook Graph Search and Adobe Photoshop, and granted patents. He held the Olympic Torch of Beijing Olympic Games as a torchbearer in 2008, won the Tech Draft (a nation-wide programming challenge) in 2014, and is a certified airplane pilot. 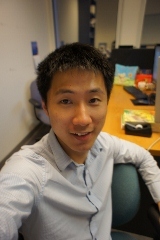 His current research interests include computer vision and machine learning, especially data-driven approaches for 3D data. 2014 Research Intern, Creative Technologies Lab, Adobe, Seattle, WA. 2014 Research Intern, Natural Interactions Group, Microsoft Research, Redmond, WA. 2013 Research Intern, Creative Technologies Lab, Adobe, Seattle, WA. 2012 Intern, Entities Team, Facebook, Menlo Park, CA. With more than 20 years' programming experiences, including those in Facebook, Microsoft, and Adobe, and the still ongoing PhD education, I am super interested in pushing things looking impossible to the reality, thus bring values to the users and profits to the company. As a PhD student, I'm learning how to choose "good" topics and how to tackle very hard problems with fast learning and experiment-supported logics, while also being able to use 20+ programming languages/platforms to actually get things done. For my demos, please visit [Turn on javascirpt to check the link]. *Last updated on March 2015.